It’s said that Mustafa Kemal Atatürk himself donated money for the stadium back in 1926. We weren’t able to confirm that, but it’s not of crucial importance anyway. After all, the current shape wasn’t born until 1970s and Bursaspor as a club operates since 1963. And ever since they began playing football, the “Green Crocodiles” had been using the Atatürk Stadyumu for their home fixtures. Sunday saw the very last one, in which Bursaspor defeated Mersin İdman Yurdu 2:1. The away team was first in having a new stadium though, because they moved to their new ground in 2013, while delivery of Timsah Arena was seriously delayed. 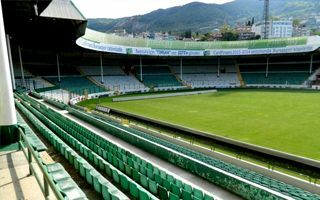 But finally on January 10 Bursaspor will play their first game in the new 43,500-capacity stadium, a huge leap from the old 25,600-seater. Although we’re not sure of the exact capacity after yesterday afternoon, because many spectators actually took their seats with them as souvenirs, marking the end of professional football in central Bursa.